It’s my pleasure write a graphic novel review that I’ve been waiting to write for some time. I know I said I would be reviewing books from people that I met this year, but this indie book fits in with my pledge of being indie even if I met Tod Emko a few years ago at New York Comic Con. A Piggy’s Tale is a book that you should all go support right now! This amazing tile is non-profit with all proceeds going to help animals in need. Please go here for info on helping the cause and more info on the organizations involved. So, I met Tod Emko in New York with Piggy (the actual dog) at his booth selling the Piggy book and fighting the good fight: the humane treatment of animals worldwide. 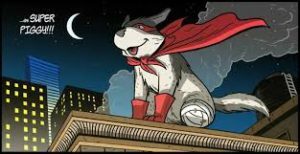 Piggy is an actual 3-legged dog that Tod rescued and created a comic about. The comics (four of them) have since been collected into an amazing graphic novel that’s now available. I picked up my new copy at Denver Comic Con this past June! And Tod has been wonderful presenting with us on panels across the country about social justice and the importance of inclusion in our media. He even came to my classroom and spoke with my Graphic Novel class a couple of years ago during C2E2 weekend, and it was awesome! When we present at cons, a common question posed to us is if we know any comics that feature characters with disabilities that aren’t villains, I know, it’s sad, but if you think about it, a lot of the disabled characters in pop culture have been villains. 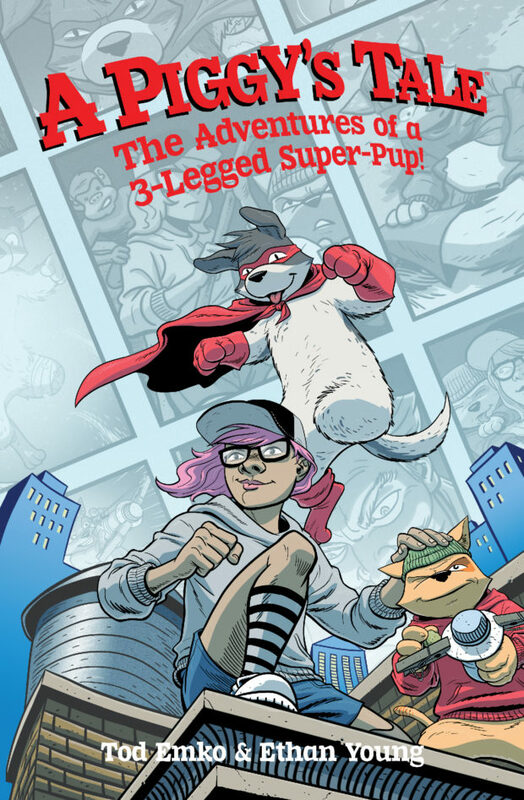 However, A Piggy’s Tale is about a 3-legged Super-Pup that fights crime with a teenage girl (that is also missing a leg) and a stray cat named Simon. Fighting against the odds, the super-team uses the power of empathy to correct injustices. This is the book that people have been looking for to let kids know that even if they are different in any way, they can be ultra heroic! And the cool thing is…it’s not even an issue to the characters in the book; they are just heroes. The art in the book is great. Eisner-nominated Ethan Young is the artist. He was the mind behind Nanjing: The Burning City: a review a did during Dark Horse Week, and if you love his art in this Piggy book, I suggest you check out my review of Nanjing here. 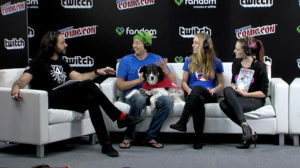 If you go to any cons, see if Tod and the Piggy crew will be there, and if they are, please go visit them and drop a buck or two in their donation box, and learn more about Darwin Animal Doctors. And if you can, get a hug from Tod. He gives the best hugs…like seriously.